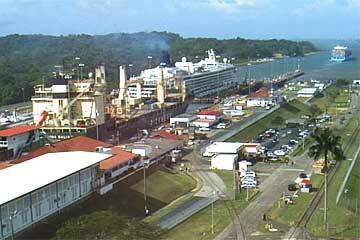 The Norwegian Star Cruise Ship in the Panama Canal January 20, 2010. 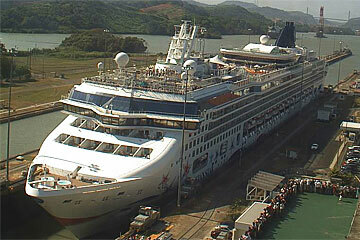 Norwegian Star is a Libra class cruise ship operated by Norwegian Cruise Line. She was built in 2001 by Meyer Werft, Papenburg, Germany. Freestyle Cruising is all about giving you the freedom and flexibility to have your style of vacation. Relax or be adventurous. Eat a burger or filet. Dress up or go casual. And never have a schedule or restriction to slow you down. It's your vacation, so make sure it's exactly what you've been daydreaming about. You'll find our fleet of new ships have everything you need to have your perfect cruise vacation. 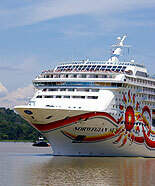 The Norwegian Star is seen in the attached images here on her North Bound Panama Canal Transit on January the 12th 2010. 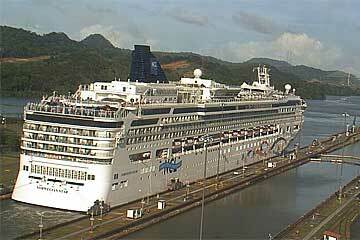 Click here to see the Norwegian Star Cruise Ships Onboard Live Camera. This ship entered service at the end of 2001. She was originally intended to operate with Star Cruises under the name SuperStar Libra, but six months before delivery it was decided that the ship would be assigned to Star Cruises' subsidiary, Norwegian Cruise Line. The vessel was christened at the Port of Miami in a dual ceremony with another new NCL vessel, constructed at Germany's Lloyd Werft shipyard, the Norwegian Sun.